Provencal mustard is a fantastically flavorful mustard that often gets overlooked.. Made with a base of dijon and blended with roasted red peppers, garlic, and herbs, this mustard packs a ton of flavor with little to no calories. 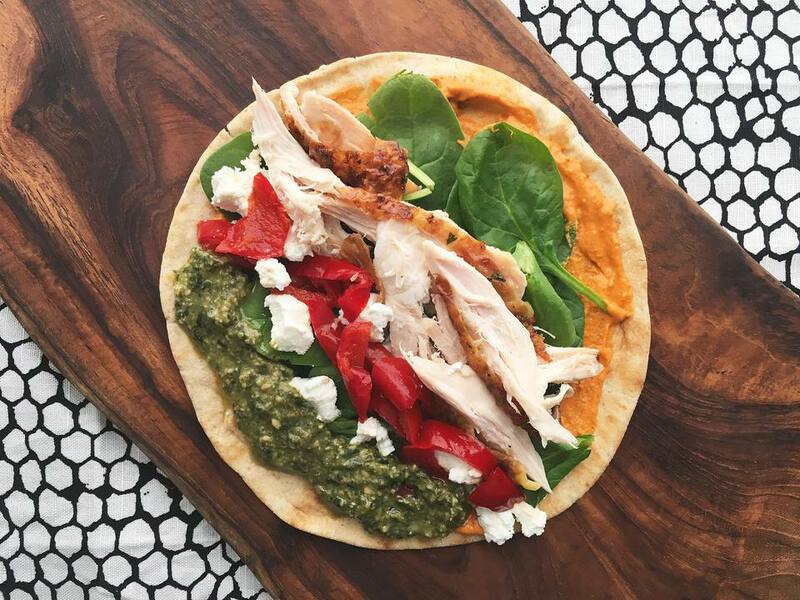 Smear some of this flavorful spread on a warm whole wheat wrap and top with fresh nutrient packed spinach, bright and lively pesto, rich and tangy crumbled goat cheese, sweet and spicy peppadews and protein packed rotisserie chicken. To make this recipe, I used leftover pulled rotisserie chicken but you could totally use a another protein such as grilled steak, seared shrimp, or baked fish. And if you don't eat meat, you could totally just add a roasted portobello mushroom or some pan fried tofu. And if you can't find provencal mustard and need to adapt, I recommend trying to swap out the provencal mustard for some really good roasted red pepper hummus or even some sun dried tomato tapenade. Begin by warming the whole wheat wrap in the oven or in a toaster. Next smear on the provencal mustard onto one half of the wrap and pesto onto the other. Add spinach and top with roasted chicken, peppadews, and crumbled goat cheese. Roll in half or fold like a taco and enjoy. This sandwich is best made right away but if wrapped tight and stored in the refrigerator, this sandwich can last up to 6 hours before getting too soggy.